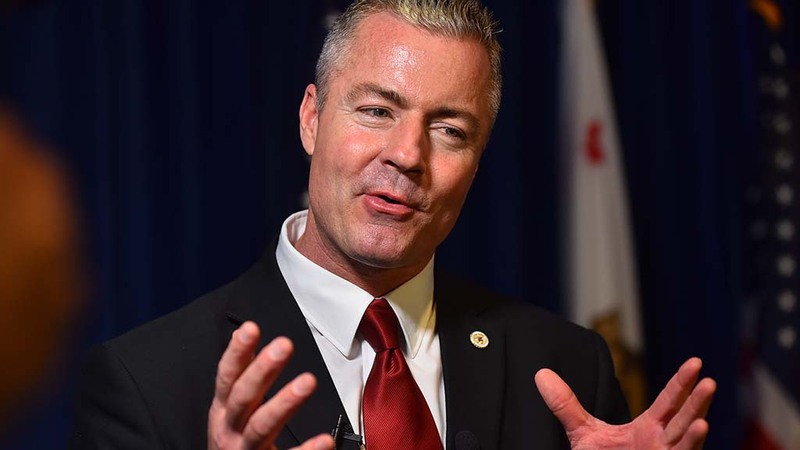 Republican gubernatorial candidate Travis Allen called Monday for voters to “take back California” during a stump speech outside the City Administration Building on the day before the election. Surrounded by several dozen supporters wearing “Make America Great Again” hats and waving tiny American flags, the Orange County assemblyman who grew up in Chula Vista said he’s the only Republican candidate capable of fitting a Ronald Reagan-esque “rock-solid conservative” mold. Allen, who is representative of the GOP’s far-right wing, took a campaign hit last month when President Donald Trump endorsed opponent John Cox, a Rancho Santa Fe businessman. A UC Berkeley survey released last week shows Cox polling at 20 percent among likely voters, second only behind Democrat Gavin Newsom, at 33 percent. Democrat Antonio Villaraigosa is polling third at 13 percent, while Allen sits in fourth at 12 percent. During his speech, Allen took several shots at Cox, who voted for Libertarian presidential candidate Gary Johnson over Trump in 2016. “There is only one candidate in the entire governor’s race who voted for, supported, and even wrote op-eds in support of the Republican nominee for president … John Cox is a never-Trumper. Ladies and gentlemen, we don’t need another RINO,” Allen said, using a pejorative that refers to Republicans who aren’t sufficiently conservative. Allen detailed his five-point plan, which includes cutting taxes, reducing crime, fixing roads, dumping high-speed rail, improving education and bolstering water infrastructure. He said he would increase border security and push to revoke California’s so-called sanctuary policies that limit cooperation between local law enforcement and federal immigration authorities. Allen claimed, without evidence, that Democrats control the state legislature due to “decades” of widespread voter fraud. Allen also reaffirmed his support for gun ownership, specifically concealed carry permits.